On the final day of the BYU Genealogy and Family History Conference, FamilySearch announced that conference attendees would be able to keep their New FamilySearch accounts. Attendees were given strict instructions not to submit names until given permission. Since New FamilySearch makes name submission so slick, the Insider hopes attendees don't slip. This is the first in a series of four installments on Bill Mangum's presentation, "The Opening of the Digital Pipeline," from the final day of the BYU Genealogy and Family History Conference. Today we'll present the analogy of a pipeline and introduce the stages in the digital pipeline. Next week, in the second chapter, we'll talk about handling gaps in the pipeline and we'll start down the pipeline, explaining the first several processes. In the third chapter we'll continue down the pipeline to the Infobahn stage. In the fourth and final chapter, we'll finish relating Mangum's presentation, talking about Record Search and FamilySearch Labs. Dilbert, courtesy United Feature Syndicate, Inc.
Mangum's point was that he would be telling us about things, some of which do not yet exist. And by the end of the presentation, even the Insider was heard mumbling, "I gotta get me some of that." 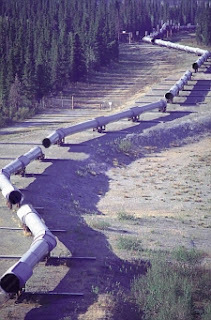 Mangum showed a photograph of a pipeline similar to the one to the left. While Mangum chose a photo of the trans-Alaska pipeline running across ugly desert permafrost, the Insider insisted on the more picturesque Denali Fault area. 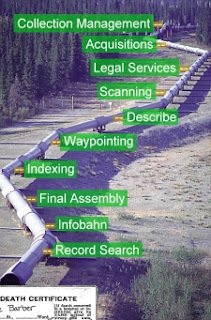 This diagram represents a fully functional, largely automated process that quickly takes new records, processes them through all the stages of the pipeline (collection management, acquisitions, legal services, scanning, describe, waypointing, indexing, final assembly, Infobahn and record search), making the records available quickly and efficiently to a world-wide audience. Unfortunately, today the pipeline is a pipe dream. Fortunately, progress is being planned, managed, measured and achieved. The FamilySearch development team uses a tool for Business Progress (or Performance) Management (BPM) to aid in construction of the pipeline. FamilySearch uses BPM to define what is to be done, track where it is at, know when it is done, and report on how well it went. Currently, there are gaps in the pipeline, visually represented in the diagram to the right. Some parts of the process are either not yet automated or not yet optimized. Next week, we'll learn how these gaps are managed and explain a bit about each stage in the pipeline.